84 years ago last night, September 16th-17th, 1928, a hurricane made landfall in south Florida. The eye made landfall near West Palm Beach and then moved right over Lake Okeechobee. Thousands of migrant farm workers, mostly black, lived in the low areas near Lake Okeechobee. There was a 5 foot dike to keep the waves out during storms, but it was no match for the hurricane. The figure below details the area that completely flooded. The southern end flooded first; when the eye passed over the northern end that area flooded as well. People living in the area had evacuated initially but the hurricane did not show up when predicted. They went home, a fatal mistake. Thousands perished, many bodies being washed into the Everglades where they were never found. The racism of the day dictated what happened next. The few coffins were given to bury white victims; the black victims were either burned or dumped in mass graves with no memorial markers. It was only in the last several years that markers were put up. The Red Cross initially estimated the dead at 1,836 but because so many bodies were never found and the migrant population was not well documented, that number was probably much higher. In 2003 the death toll was revised to "at least" 2,500 to reflect that. 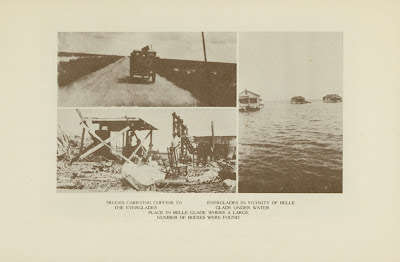 This makes the 1928 Lake Okeechobee Hurricane the second-deadliest to make landfall in the U.S. (the greatest being the Galveston Hurricane of 1900 with a death toll of 8,000 - 12,000).